Bombs exploded for a second straight day Monday in the public market of a religiously mixed town south of Baghdad, killing five people, as Sunni lawmakers boycotted parliament to demand the release of a colleague they suspect was kidnapped by Shiite militiamen. Two blasts ripped through the outdoor market in Mahmoudiya — the first about 12:30 p.m. and the second four hours later. Three people were killed and 22 wounded in the first blast, police Lt. Mohammed Khayoun said. The toll for the second was two dead and three injured, he added. Late Sunday, three people were killed and 10 others wounded in a blast in the same market in Mahmoudiya, a flashpoint of sectarian conflict between Shiites who live inside the town and Sunnis who form the majority in surrounding farm communities. At least 11 other people were killed Monday, including a U.S. Marine who died in fighting in Anbar province west of the capital, according to Iraqi and U.S. officials. The U.S. military also reported an American soldier died Sunday in a roadside bombing north of Baghdad. Rising sectarian tensions threaten to undermine Prime Minister Nouri al-Maliki's plan to restore stability in Iraq and stem the slide toward civil war. U.S. officials hoped al-Maliki's government of Shiites, Sunnis and Kurds, which took office in May, can win public confidence, reach out to Sunni insurgents and clamp down on sectarian militias. But cracks have already begun to appear. The largest Sunni bloc in parliament boycotted a legislative session Monday to press their demands for the release of Sunni female legislator Tayseer al-Mashhadani, who was seized two days ago by gunmen in a mostly Shiite district of the capital. Sunni politician Noureddine al-Hyali said al-Mashhadani was believed held somewhere near eastern Baghdad's Ur neighborhood — a predominantly Shiite area controlled by the Mahdi militia of radical cleric Muqtada al-Sadr. "We got this information from Iraqi security forces as well as the Americans," al-Hyali said. There was no confirmation of his claim. Other Sunni politicians repeated al-Hyali's allegation but refused to be identified by name for fear of retaliation by Shiite extremists. However, a Shiite official with close ties to al-Sadr, Ali al-Lami, insisted the Mahdi militia was not holding al-Mashhadani and had offered to help find her. The Sunni boycott, if it lasts, threatens to undermine the U.S. strategy to lure Sunni Arabs away from the insurgency so U.S. and other international forces can begin heading home. Bassem Sherif, a member of the main Shiite bloc, urged the Sunnis to come forward with any information about the kidnapping and end their boycott. "Such a boycott only serves the goals of the terrorists because they will feel that they have succeeded in hampering the political march in this country," he said. Slain terror leader Abu Musab al-Zarqawi has been buried in an undisclosed location, the U.S. military and Iraqi government officials said Sunday. Iraqi National Security Adviser Mouwafak al-Rubaie told The Associated Press that al-Zarqawi had been buried in a "secret location" in Baghdad. The U.S. military confirmed the burial but declined to give more details. The Iraqi government released a list of its 41 most-wanted people. 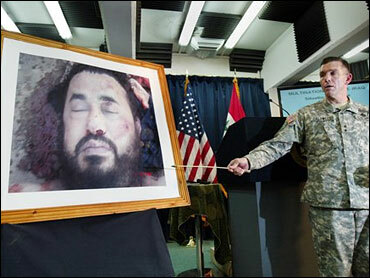 The largest reward was $10 million for Izzat Ibrahim al-Douri, a former top official in the Saddam regime. The list also includes Saddam Hussein's wife and oldest daughter. In another sign of rising sectarian tensions, gunmen burst into the home of a Sunni family 12 miles south of Basra, killed a father and his son and kidnapped six other people, a police officer said on condition of anonymity for fear of reprisals. With violence raging at home, top Iraqi officials have fanned out across the Middle East, seeking support from neighboring countries for the new government's reconciliation plan. Al-Maliki arrived Monday in the United Arab Emirates on the second stop of a three-nation Persian Gulf tour. The prime minister, a Shiite, held talks last weekend with officials in Saudi Arabia and will travel on to Kuwait before returning home. Meanwhile, Foreign Minister Hoshyar Zebari, a Kurd, conferred Monday with Turkish officials in Ankara, and parliament speaker Mahmoud al-Mashhadani, a Sunni, journeyed to Iran. Turkish Foreign Minister Abdullah Gul called on Iraqis to support the government's reconciliation plan. Elsewhere, seven people were killed and 28 wounded by a car bomb in the northern city of Mosul, police said.